With equities seeing some weakness into the early afternoon, the VIX clawed higher (intra high 14.34), but settling +7.9% @ 13.39. Near term outlook is for continued broad equity upside.. which should keep the VIX pinned within the 14/11 zone into mid May. We continue to see sporadic little intraday spikes.. but the highs remain very low... in the low teens. The big 20 threshold looks unlikely to be challenged until June. 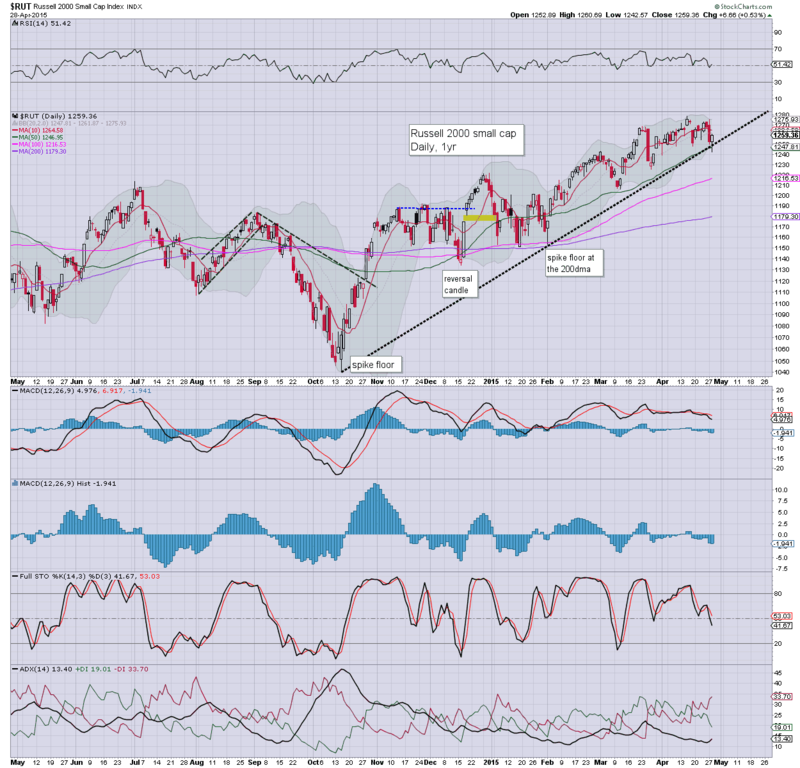 US equities closed weak, sp -7pts @ 2106 (intra low 2097). The two leaders - Trans/R2K, settled lower by a significant -1.2% and -1.0% respectively. 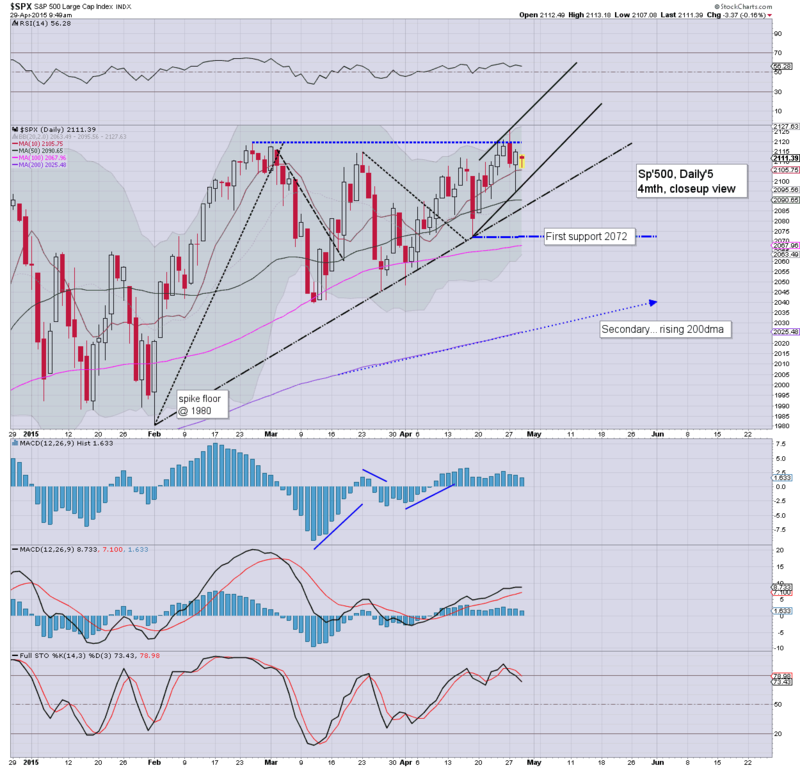 Near term outlook offers a little further weakness, whilst the broader trend remains strongly bullish... with the sp'2170/80s viable by mid June. Suffice to say.. an interesting and rather good day for yours truly. Despite the net daily index declines, it remains the case that the equity bears just can't muster any significant.. or sustained downside. 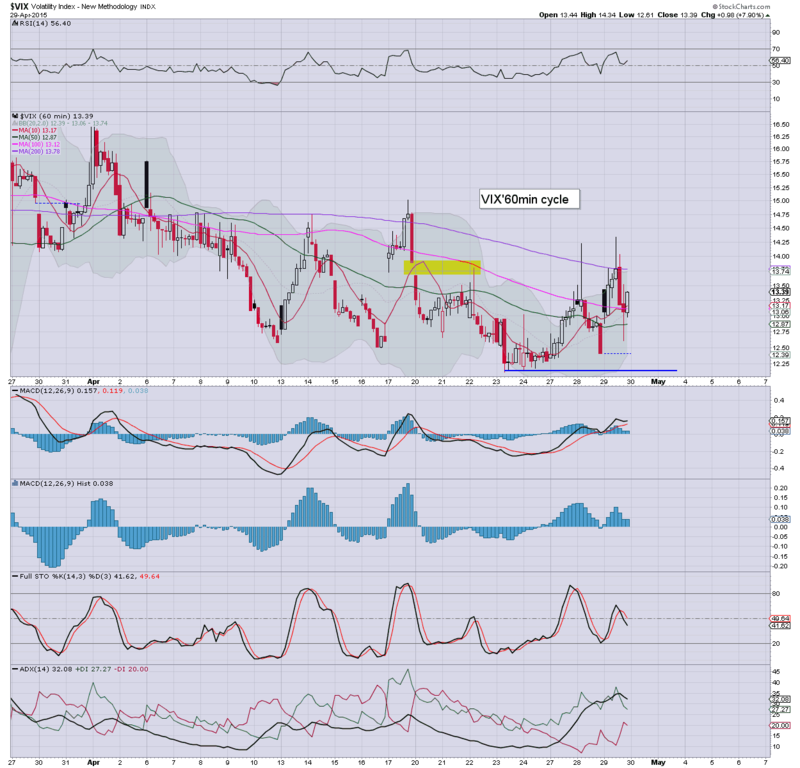 VIX continues to reflect a market with next to zero concern about anything, least of all a GREXIT. *I will consider going re-long Oil tomorrow... and/or long-Euro.. via FXE. Euro looks set for 1.17/1.20 by mid June. Like the recent instances of TCK and DISCA (amongst others)... I would not be surprised to see CRM refute the story.. for the stock to collapse AH or early tomorrow. Risky situation.... for those still long.. and holding overnight. 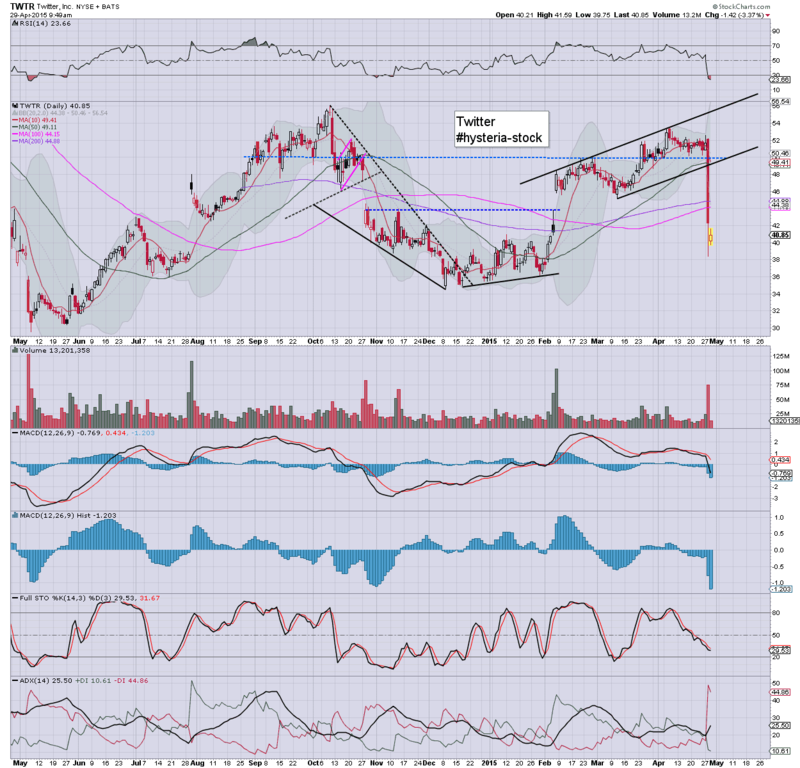 notable weakness: TWTR -8.2%.... utterly dire near term outlook.. at least to the 36/35s... if not the Dec' low of $34s. 3.18pm.. Equity chop... but clearly.. no sig' downside right now.. despite the USD holding well above the earlier lows. The latest FOMC announcement is due, although no policy change/rate hike is now likely until September. Equities are already seeing something of a recovery, with a net daily gain viable for all indexes. Oil is starting to cool from the earlier high, as the USD is trying to bounce. 2.06pm.. spike floors on the smaller equity cycles... a net daily gain looks probable. Meanwhile... TWTR still falling -7.4%... the $38s are imminent. Next key support is 36/35... which will likely hold. 2.14pm...Every tick higher in the USD.... equities, oil, metals.... tick lower.... naturally. 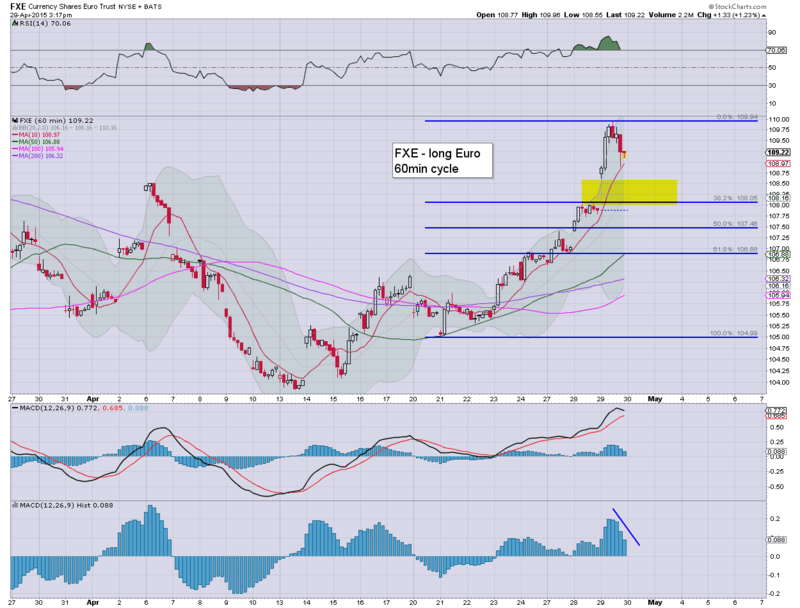 2.28pm USD having bounce from -1.4% to -0.8%.... interesting move... it'd seem the USD will probably start Thursday moderate higher... will be tempting short... or long Euro... via FXE. ..TWTR just keeps on falling -8.0% in the upper $38s.... no one wants to buy until 36/35. 2.45pm... oh lookie... Salesforce (CRM).. suspended.. after hyper-ramping for no known reason..
.. no.. its not earnings. 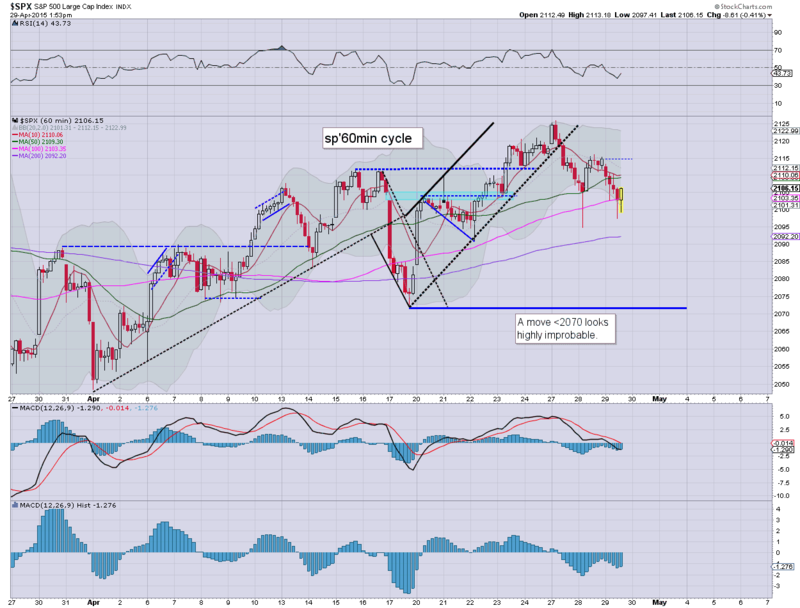 US equities remain weak with the sp' -13pts @ 2101, and it remains a case of no significant downside. USD remains broadly weak, -1.2%... but susceptible to latter day (post FOMC) strength. Metals remain a touch weak, Gold -$2. Oil continues to build gains, +3.8%. Oil is notably strong, with the latest EIA report pleasing traders that perhaps draw downs are coming in May/June. 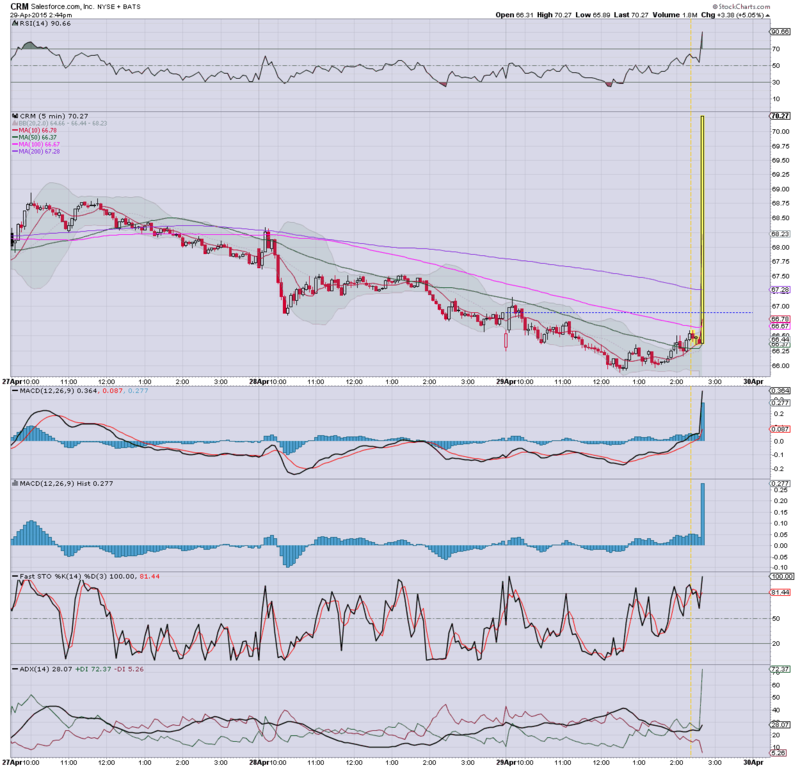 *Having exited USO-long at $20.08.. I'm content to just watch for the rest of today. FOMC is due at 2pm.... I'd expect some moderate market swings.. but broadly.. we look set to recover higher into the close. US equities have naturally slipped into a holding pattern ahead of the FOMC announcement (due 2pm). Most indexes look set to resume higher after the latest Fedspeak. USD remains broadly weak, -1.2% in the DXY 94.80s. Metals are a touch weak, Gold -$3. Oil is building sig' gains of 3.0%. *I exited USO-long an hour ago... very content with the exit. Will consider going long on any sig' pull back. Market looks set to trundle sideways into 2pm. Regardless of any initial down wave... I'd still expect market to claw somewhat higher into the close. notable weakness: -4.9% @ $40.20.... the CEOs appearence on clown finance TV has not exactly inspired the momo chasers to hit the buy button. Whilst equities continue to see moderate weakness (but liable to turn positive this afternoon), there is notable sig' weakness in the USD, -1.0% in the DXY 95.10s (intra low 94.88). First target zone of 93/92s is clearly probable by mid May. *I will continue to use UUP as a way to highlight USD, since stockcharts don't offer intraday charts on the DXY. So.... USD weakness continues... 93/92s now look easy to hit. Increasingly... the 90/89 secondary target looks viable in June. 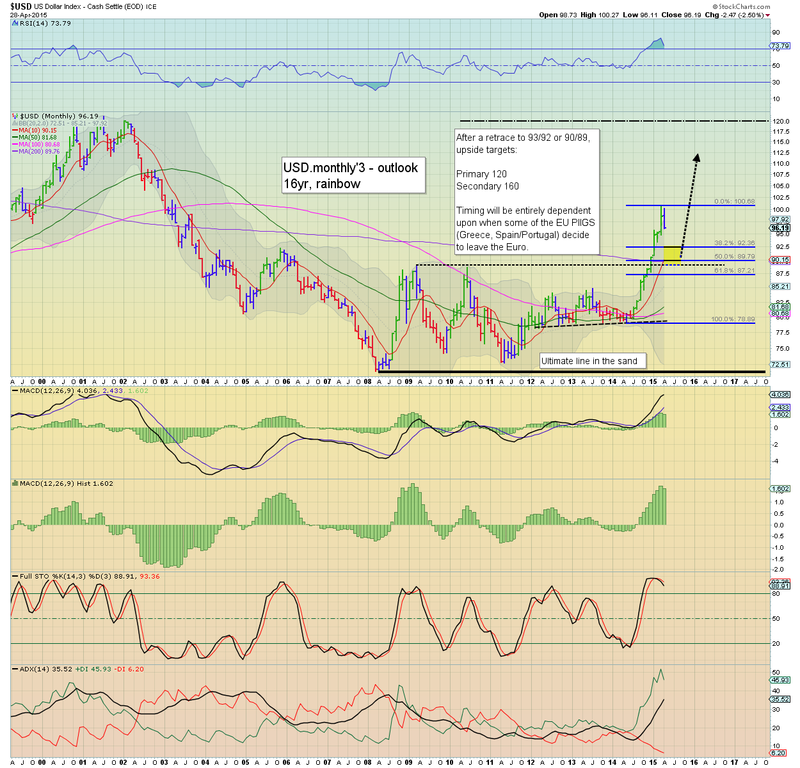 If the USD can floor in June/July..... it would help make for a natural equity.. and Oil cycle top. *I remain long Oil via USO... I am trying to give it some time to build gains before my next exit. In any case... at least I'm not long TWTR, -4.5% in the low $40s. 11.07am.. EXITED long-USO... from 20.08.... moderate gain... it'll do.. will look to re-long.. on any pull back. Again its a case of a moderately weak open, with no real downside power, a latter day recovery looks due. The market is set to enter a holding pattern until the FOMC announcement of 2pm. Metals are a little weak, Gold -$4. Oil is +0.3% ahead of the latest EIA report. A very disappointing open for those in bear land. Lousy GDP data... pre-market weakness of sp-13pts.... only to open -6pts.. and already in danger of turning positive! Whether you want to blame the central banks, stock buy backs, or just plain crazy 'momo chasers',... this is no market for the bears. An opening reversal candle.... but TWTR has a long day ahead... with the CEO to appear on clown finance TV in the 11am hour. Market still seems more rattled by the early release of earnings, than the usual lousy earnings/outlook. 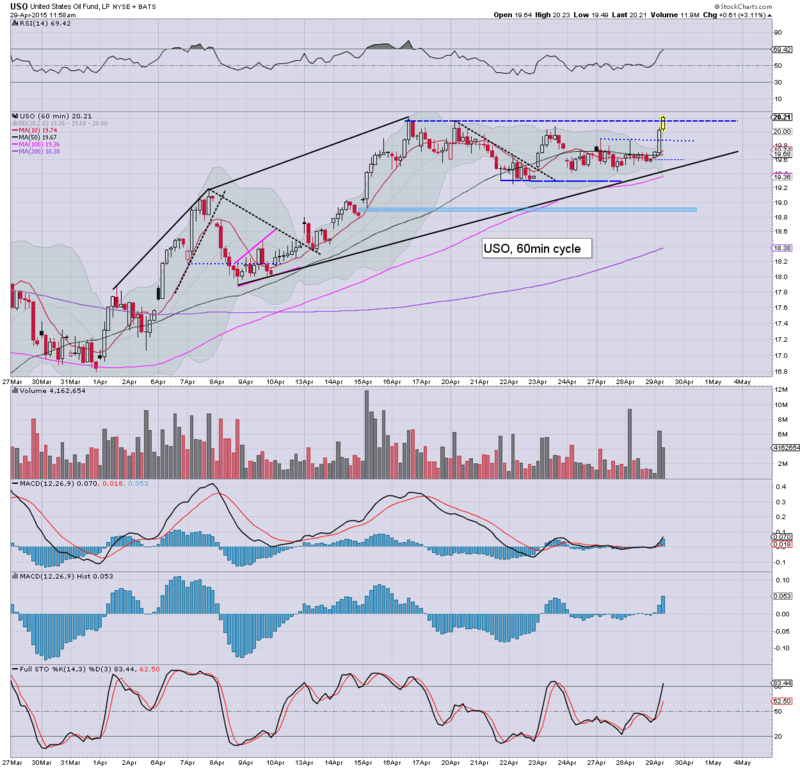 A daily close <$40 would be a real problem, and open up a likely move to the 36/35s. before flooring. For now... I'm not getting involved in the TWTR nonsense.... but it remains a great deal of free entertainment. 10.24am.... EIA report due.... with sp -11pts. It remains notable that we're still well above yesterdays' low of sp'2094. *TWTR unable to hold the $40 psy' level... it would seem 36/35 is due in early May. Oil is on the rise, +1.1%... still set for the $60 threshold. 10.35am.... NEWS update.... the Ben Bernanke is now a senion advisor at PIMCO. Good morning. Futures are a little lower, sp -5pts, we're set to open at 2109. Metals are weak, Gold -$3, with Silver -0.4%. Oil is -0.2%, ahead of the latest EIA report. We have an interesting day ahead.... not least with the Oil report at 10.30am.. and the FOMC at 2pm. notable weakness: TWTR -2.6% in the low $41s. 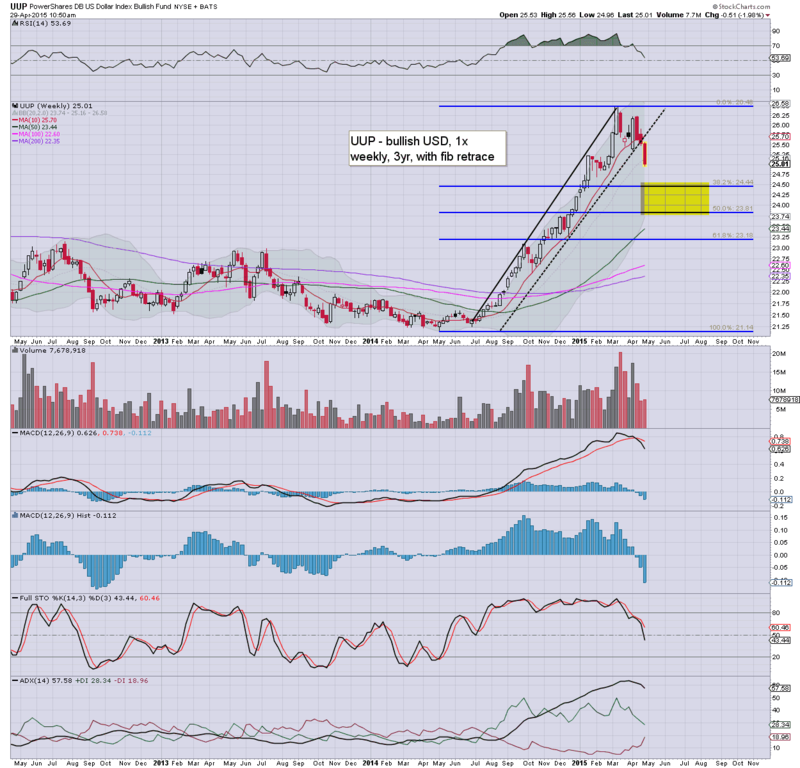 A daily close <$40 would be a real problem, and open up 'some weeks' in the mid/low $30s. Lumber liquidators -16% in the $27s. Did they not fix the toxic floors yet? 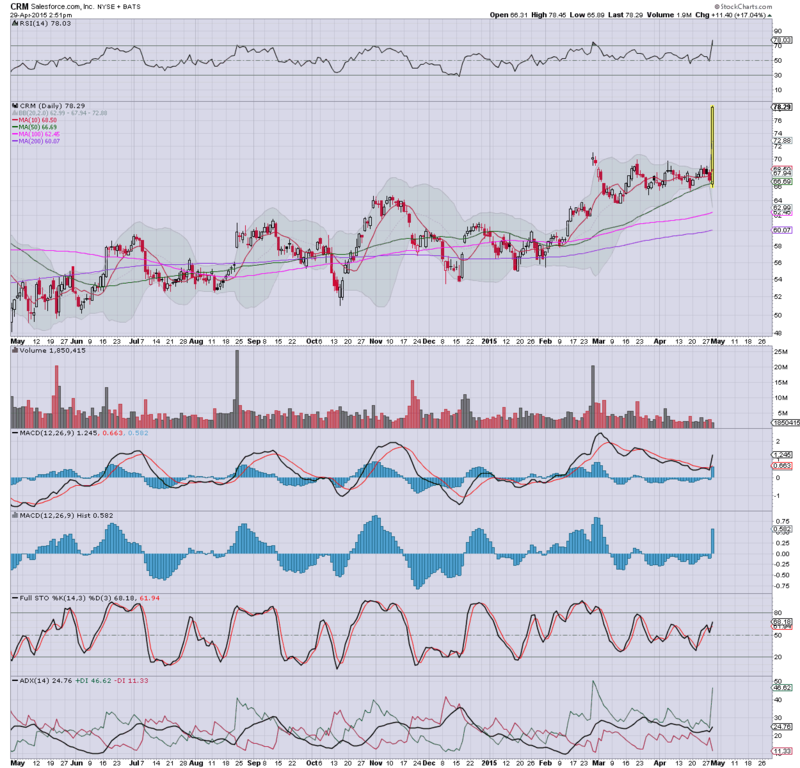 strength: GPRO +12% in the $51s... post earnings.. although it is notable that the stock was initially -5%. Lousy number... no question about it. USD remains weak, -0.4% in the 95s. Already close to first target zone. Equity indexes cooling a touch on the news.. sp -7pts.. 2107. ... now its a case of what the FOMC statement is.... I'm guessing the market will manage to still broadly climb. 8.42am.. USD still rapidly cooling, -0.6% in the DXY 95.40s. We're now a ful 5% lower from 7 weeks ago. At this rate.. we'll be back to the breakout zone of 90/89 by mid June. If that is the case, I'll be going long UUP for a hyper-wave ramp to the 120s. We've not forgotten about Greece, or the other EU PIIGS have we? 9.11am.. Indexes are snapping lower , sp -13pts... back to 2101. If yesterdays low of 2094 is taken out... then things will get interesting. In any case... the market is awaiting the FOMC.. although that won't see any actual changes... will it ? The underlying issue.. as with all things... one of 'fair value'.... and before items.. TWTR actually saw a Q1 loss of 25 cents.. rather than the 7 cents headline number. 9.37am.. sp -6pts... which is a pretty lame open for the bears. The USD - King of paper world, continued to cool, with a net daily decline of -0.8% @ DXY 96.29. The 93/92s are within easy reach by mid May. Secondary target zone of 90/89 looks viable by mid June. 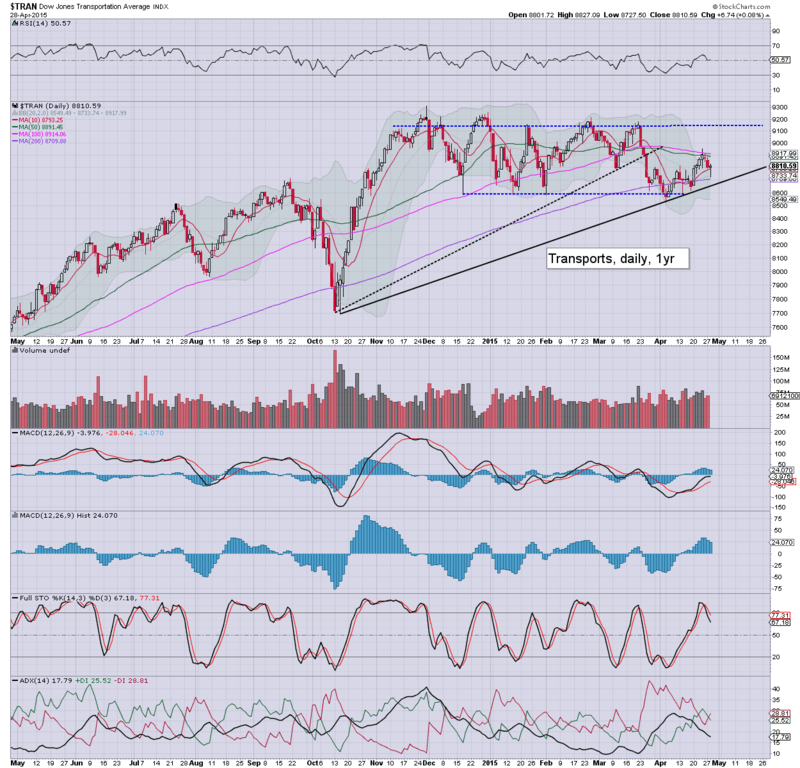 Broader hyper-upside to the 120s looks due on the next wave... beginning sometime this summer. Suffice to say.. the fifth consecutive net daily decline, and the DXY 95s are already close. The first target zone of 93/92s looks easy to hit within the next 2-3 weeks. The above chart should clarify what I am seeking in the mid term. Under no outlook do I see sustained trading under the old breakout level of 90/89. 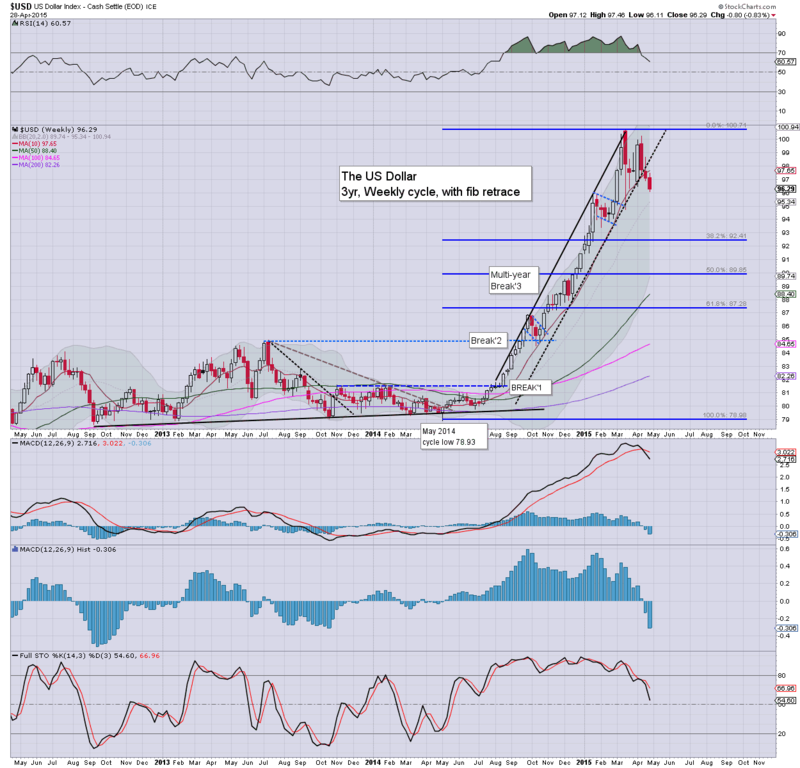 After all, do you really think the Euro/Yen are not going to devalue faster than the USD? Then there is the issue of huge capital inflows to the USA... increasing the upward pressure. *I am looking to be long the USD (via long equity positions, but also UUP long dated option calls).. this summer. I will be seeking an entry in the 90/89 zone... which looks just about possible in June.. before the first realistic opportunity of renewed upside. Wednesday will be pretty important, with Pending home sales and the latest EIA report. However there is also the first reading for Q1 GDP. 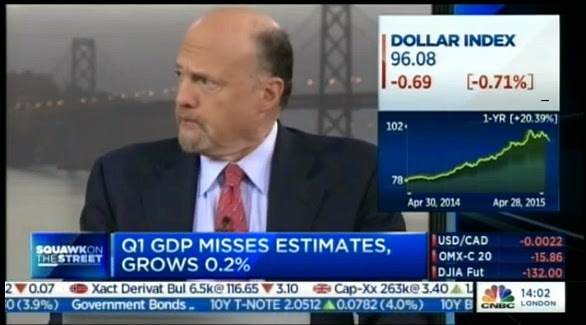 Market is expecting 1.0% growth, vs the Q4 of 2.2%. Further.. we have the latest FOMC announcement (due 2pm). No change in policy is likely. There will NOT be a post Yellen press conf. US equity indexes closed moderately mixed, sp +5pts @ 2114 (intra low 2094). The two leaders - Trans/R2K, settled u/c and +0.5% respectively. Near term outlook remains bullish, with new historic highs due for all indexes. 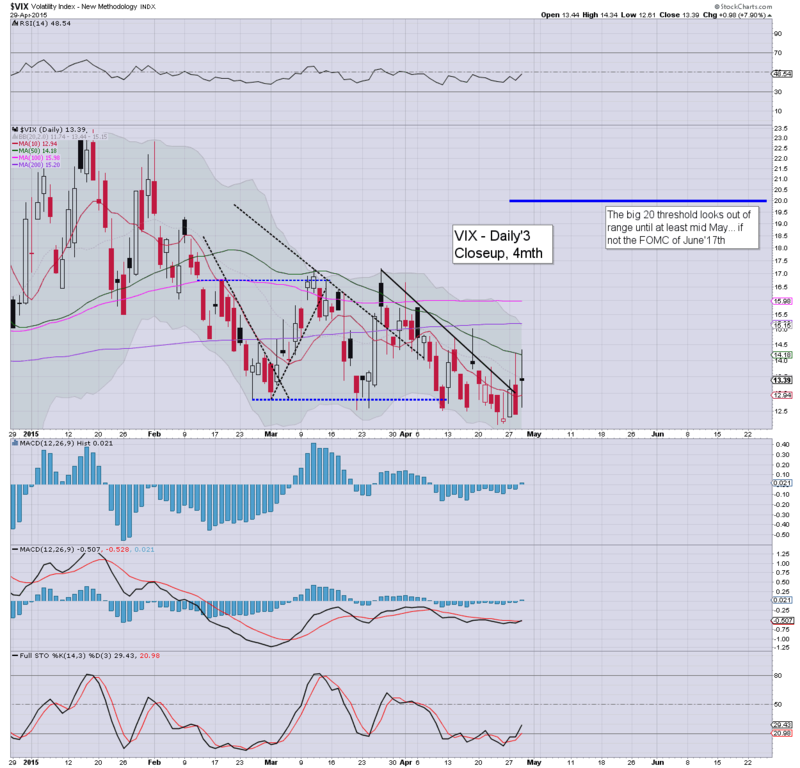 The VIX continues to reflect a market that has virtually no concern of anything. *a notable break of trend on the R2K, but the daily closing candle was somewhat bullish, offering a spike floor of 1242. Not much to add. Most indexes merely saw a minor down cycle, but held within their broader upward trends. 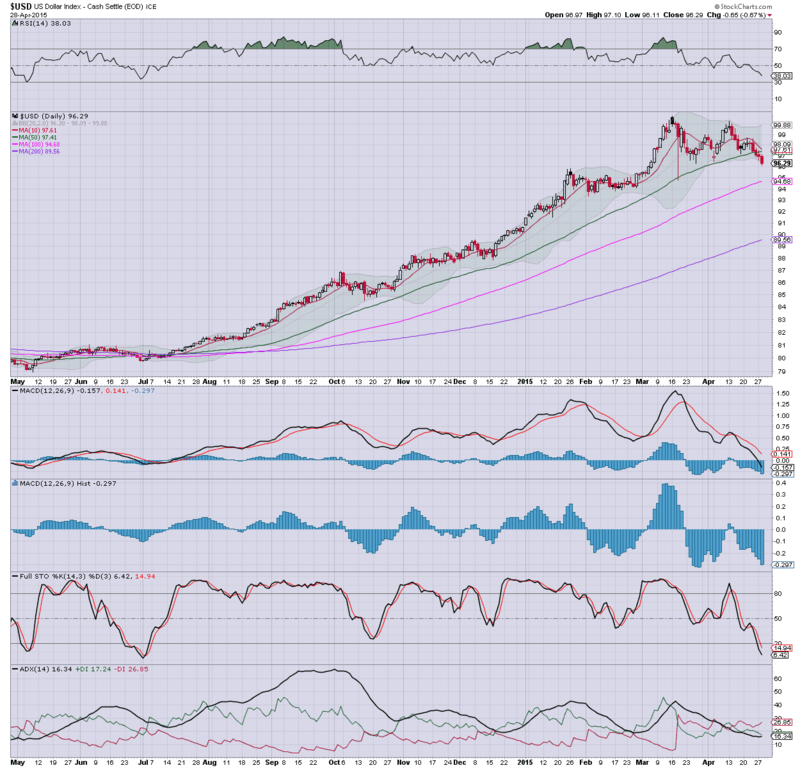 Only the R2K showed any significant downside.. but managed a relatively impressive net gain of 0.5%. 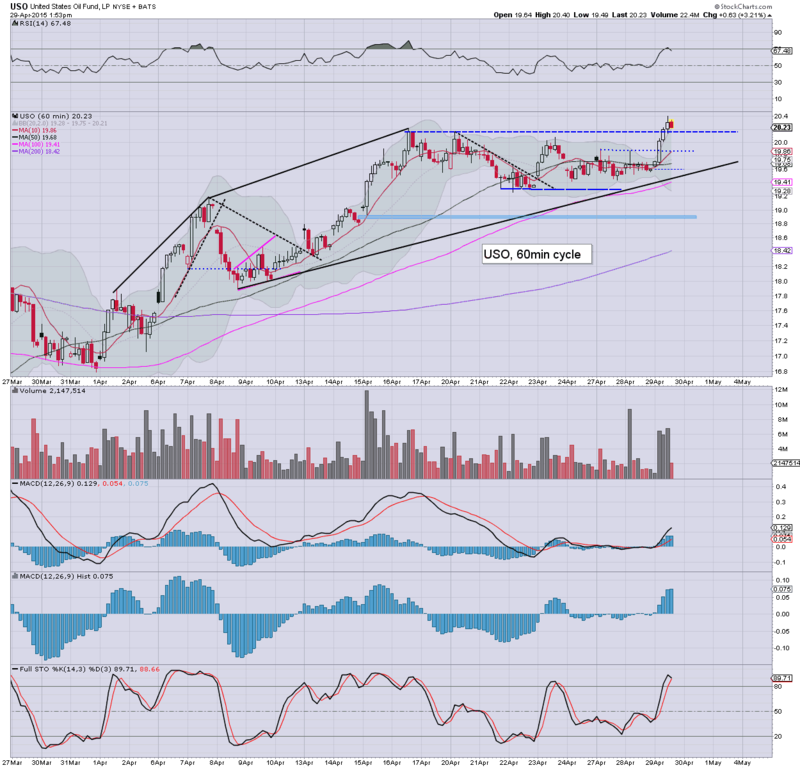 Overall... the broader trend remains unquestionably bullish.